You are here: Home / News / 2012 News Releases / 10-2012 / Wildlife on the Move! STATEWIDE – Tis the season: Colorado’s wildlife are on the move. They are migrating to wintering habitats, which is the reason this season—particularly October and November—tends to have the highest incidents of wildlife-vehicle collisions (WVCs). Wildlife-vehicle collisions happen year round, 24/7. However, there is always an increase during migration season, and particularly during the hours between dusk and dawn. These collisions are not only a matter of safety, but can be quite costly as well. According to Carole Walker, executive director of the Rocky Mountain Insurance Information Association, the insurance industry pays out nearly $1.1 billion a year in claims for all wildlife-vehicle collisions nationwide—and the cost to pay those claims is rising. The average property damage cost of collisions involving wildlife during the final half of 2010 and the first half of 2011 was $3,171, up 2.2 percent from the year before. WILDLIFE-VEHICLE COLLISION TREND – Wildlife-vehicle collisions (WVC) will vary among highways, areas and regions, and also year by year. Oftentimes, however, overall trends can be seen when multiple years of data are analyzed. Data for the period between 1999 and 2011 (please see link at top of page) show various trends, most notable being that WVCs have been on a bit of a downward trend since 2006. Per the HB 1238, the Colorado Department of Transportation identified 100 miles of wildlife crossing zones where nighttime speed enforcement was feasible. CDOT set signs within the zones (see zone chart, below): nighttime speeds are reduced to 55 mph only where current speeds are posted at 60 or 65 mph, and only during migration season, now set for October 1st through June 1st. Other sections of highway are signed “WILDLIFE CORRIDOR” but the nighttime speed remains the same—fines are doubled for speeding in all the zones, however. Study Findings: The data over the study period, which has included two full migration seasons between April 2010 and May 2012, show a slight decrease in Wildlife-Vehicle Collisions (WVC) overall within the “Wildlife Zones” in the two-year period the signs were posted, as compared with the two-year period before signs were posted. Specifically, a 9 percent decrease in WVCs is noted overall. However, there are many variables among these data sets when looking at each individual Wildlife Zone. There was an overall increase in citations written for speeding in Wildlife Zones (as compared with the previous two years) in these highway segments; this makes it is difficult to conclude if an overall drop in WVCs was a result of increased speed enforcement or driver behavior changing due to the wildlife zone and nighttime speed zone signing program. Study Recommendation: The Colorado Department of Transportation has recommended the Wildlife Zones study—per the legislation—be continued over two more migration seasons to gather additional data that could lend to a more conclusive study. In addition, the Department will supplement these WVC and citation data with day- and nighttime speed studies on select Wildlife Zone corridors. “This series of speed studies will help validate whether there is an actual change in driver behavior,” CDOT Region 3 Traffic & Safety Engineer Zane Znamenacek said. “Also, the preliminary data led us to change the enforcement period and signage to October 1 through June 1 (from the original September 1 to May 1 time period). At the end of this second two-year study period, CDOT will submit a final report to the Legislature in August 2014, indicating whether or not this signing and enforcement program has worked to reduce collisions. While the legislation asks CDOT to set nighttime regulatory speed limits, actually designating those nighttime hours throughout the season was somewhat challenging. Per the signs, speed enforcement occurs from 5 PM to 7 AM—these are dark hours in the winter, but not necessarily in the fall and spring. This may leave some motorists questioning the enforcement. Static enforcement signs must cover the entire migration season. While it’s not fully dark at 5 p.m. yet, CDOT reminds motorists that this legislation presents a safety education initiative—wildlife are moving, day and night. Motorists are asked to slow down, drive aware, and give themselves a better chance of avoiding a collision. 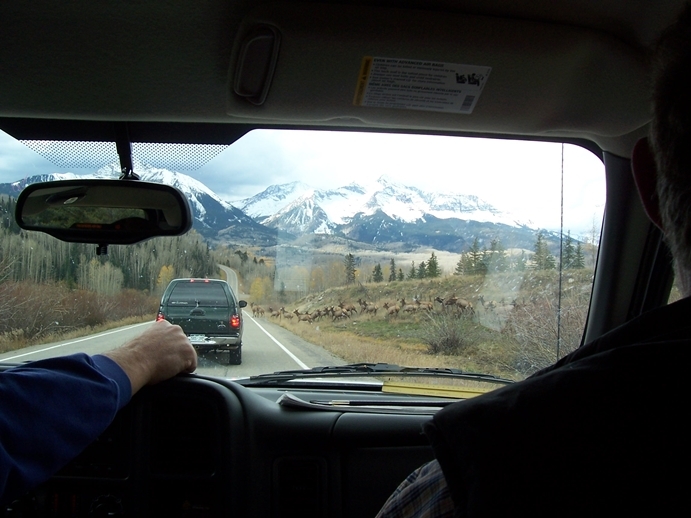 On CDOT’s Wildlife on the Move media page, there is a chart entitled “Reported Wildlife-Vehicle Collisions by Type & County;” the acronyms mean the following: PDO = property damage only; INJ = injury accident; FAT = fatal accident. Please note, the numbers indicate the number of accidents involving a PDO, injury/ies or fatality/ies. So a FAT of “3” or INJ of “3” for example does not indicate that 3 people died or were injured that year, but rather there were three wildlife-vehicle collisions where a human fatality or injury (or several fatalities or injuries) occurred. WILDLIFE ZONES (Established with the 2010 Legislation) – In signed zones where speeds were not reduced, motorists will still be fined for nighttime speeding over the posted speed limit.